The stained glass windows by Marc Chagall in the Fraumünster was at the top of my "must see" list. 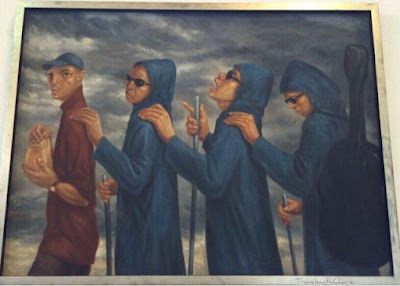 As luck would have it, a rehearsal for a music concert was in progress during my visit so I lingered and enjoyed the performances of two gifted singers while studying the works of Chagall and Giacometti. An added bonus was the crypt where one can take an interesting walk into medieval Zurich. There is a €5 entrance fee to the Fraumünster. Photography is not allowed in the church so I have no pictures of Chagall's stained glass windows but here's a link to the Zurich city guide website for a look at these blazing windows which Chagall crafted at an advanced age. Münsterhof means courtyard of the Fraumünster abbey. It was redesigned in 2014 and reopened in 2016 as a pedestrian-only zone. The large square is surrounded by the Fraumünster, old guild houses, cafés and boutiques. Major events and open air performances are also held here. The spire of St. Peter's Church appears behind the blue building. It has the largest church clock face in Europe measuring 8.64 meters (28.3 ft.) in diameter. Across the Limmat River is the Grossmünster, a Romanesque style Protestant church and one of the four important churches in Zurich. The bronze equestrian statue on the Münsterbrucke is a monument to Hans Waldmann, a military leader and the mayor of Zurich from 1483-89. He was beheaded in 1489 in what the Kämbel guild members (the donors of the statue) refer to as judicial murder. This controversial monument is an attempt by the Kämbel guild to restore Waldmann and his accomplishments to his rightful place in history. 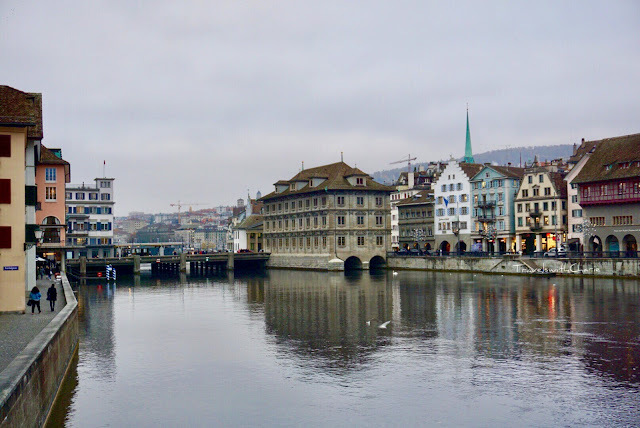 The Rathaus or Town Hall is anchored on the Limmat River. It was constructed in the 17th century and is the seat of both the cantonal and city parliaments. The medieval Zunft zur Kämbel is across the Limmatquai from the Rathaus and has a distinctive white façade. It is the present guild hall for Kämbel, originally a guild founded in 1336 for small food traders and wine merchants. There is a restaurant in the guild house serving Swiss and Mediterranean specialties. 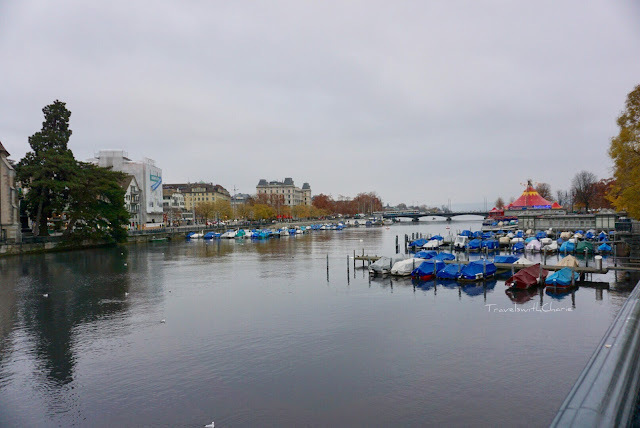 The Limmat river flows downstream from Lake Zurich to the river Aare, a distance of 35 km (21.74 miles). 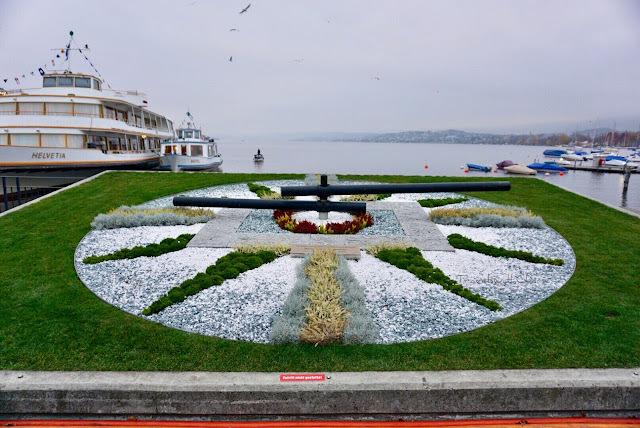 Because this is Switzerland, a flower clock is in order. This one is at the ferry terminal overlooking Lake Zurich. This courtyard conceals the Centralhof fountain and the colorful flowers which were thriving in cold and gray November weather. 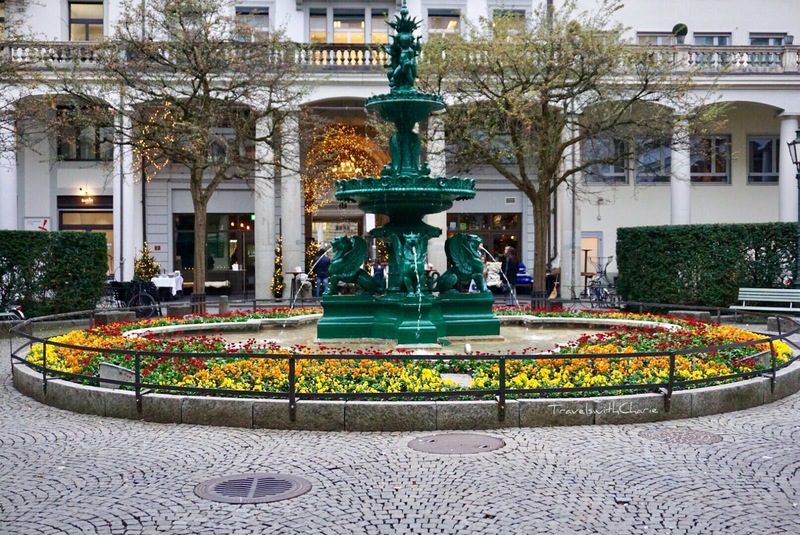 It is located between the Poststrasse and Kappelergasse. 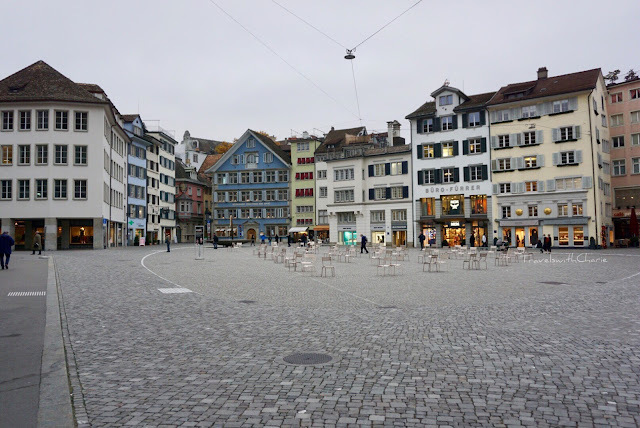 Before writing this piece on Zurich, I read about its history and found that Zurich has several names. 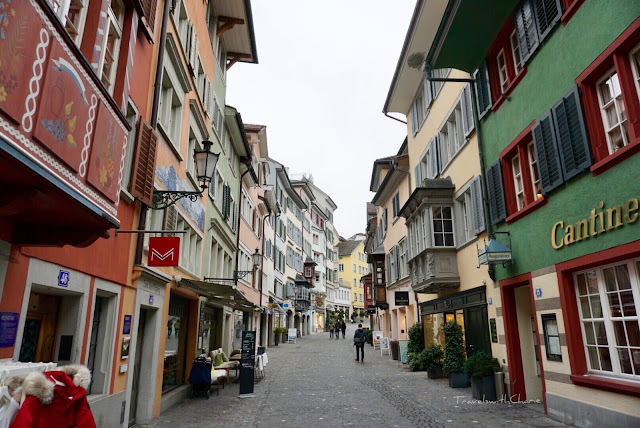 Switzerland has four official languages and Zurich has a name in each language. Zurich (pronounced zureesh) in French, Zürich in German, Turitg in Romansh and Zurigo in Italian. The Romans had a small vicus (settlement) in Zurich at Lindenhof in 15 BC and they called it Turicum. The hotel is a 5-minute walk from the Zurich main train station. The room I had was spacious. Train tickets to the airport are sold at the front desk. This comes in handy and saves time if you are taking the train to the airport. There is a Migros supermarket across from the hotel and lots of restaurants nearby.